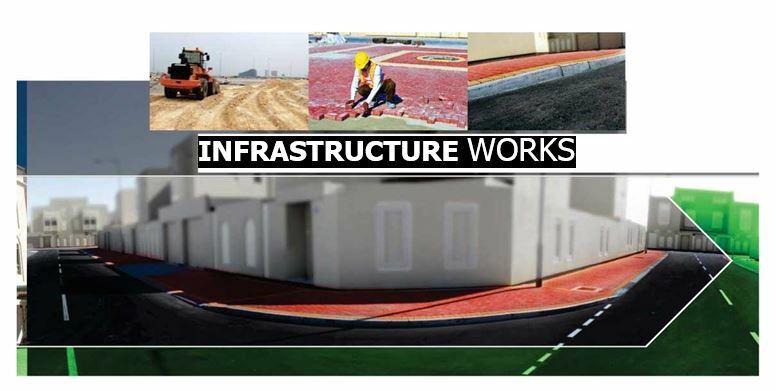 The Infrastructure Works Department of SK-Contracting is one of the prime contractors in the country offering the latest infrastructure related technologies including, but not limited to, pavement marking, sign installation and traffic control services. We are currently graded “AA” in Roads Directorate Ministry of Works. the company is also registered with the Sewerage Directorate and undertakes all the associated works such as water supply, sewers, electrical grids, telecommunications on new roads and improvement of roads. Our consultants, project managers, engineers, designers, health, safety, and environmental staff are all responsible for preparing and auditing a completed pre, at, and after project designs which maximizes the proficiency, productivity, efficiency, effectiveness and safety of all areas. These designs have to adhere to the highest standards and may exceed them to satisfy our environmental vision. Our design measures intend, but not limited to, tackling road user benefits, traffic safety, hydrological consequences, environmental concerns – aboriginal sites, heritage sites, geotechnical conditions, economic and social consequences on land owners, including severance, construction costs and future maintenance costs.